2 What are the Required Four Subjects? 3 What are Subjects Points? 4 What are the aggregate KCSE points? 5 Where do i Get course Required Subjects (4)? NOTE: Make sure you click calculate button to get results. What are the Required Four Subjects? Apart from the overall grade you scored lets say C+ there are four subjects that are required before you do a specific courses. These are the four required subjects. You are supposed to add the four subjects points and type them in the calculator field labeled (X). NOTE 1: Each course has its own required subjects. For Law courses required four subjects are different from Engineering. What are the aggregate KCSE points? These are the points you got for the seven subjects you did. For instance if you got A (plain) in all subjects then aggregated points will be 84. Where do i Get course Required Subjects (4)? You can get that by going to https://students.kuccps.net/programmes/. Select the course you want and see the required subjects as illustrated in the image below. BACHELOR OF SCIENCE IN ANALYTICAL CHEMISTRY WITH COMPUTING is available in UNIVERSITY OF EMBU. However, you cannot do that course because you are required to have a minimum of C (plain) in Maths and you have C-(minus). 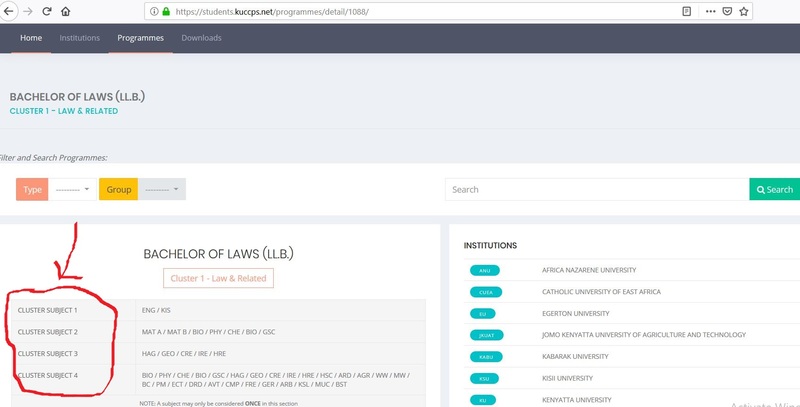 Kindly go to https://students.kuccps.net/programmes/ and select a course that you meet the requirements and we will help you in calculating. Minimum for doing a diploma in any teaching course is C unless you have a disability is one when you can join with a C-. For KU you must have cluster points of: 41.515 (Use the calculator above to calculate your cluster points). Other minimum subjects requirements for Bachelor of Pharmacy include BIO (C+), CHEM (C+), MAT/PHY (C+) and ENG/KIS (C+). How do I select a course into my course basket. Hello, click on courses on kuccps student portal, all those available are open for application. Those that have been filled are not available. I have a mean grade of B minus with B in maths, B in IRE , C in Eng , B+ in Chem D+ in kisw, C in bio , A in hist…….. can I qualify for bachelor of health records at KU.